I had to stop and ponder this sale. Now, wait a minute. Another ’70 model production convertible, this one a Plymouth, in a ponycar, not an intermediate, brings almost double the number on the Chevelle and somebody is disappointed? The difference is last year we saw a Hemicuda convertible fetch three million. Of course, that’s the ’71. The ’71 is just more rare, the last one, and collectors seem to love the different design of the front grille. Prices were high enough that a restorer, Randy Roberts (Muscle Car Restorations in Owasso, Oklahoma) told me on the phone he was already feeling the effects of the auctions in Arizona before they were over. They referred to the conservative 335 horsepower rating, which pushed the CJ down in the Super Stock classes of NHRA, making it a sleeper. I never was clear if this CJ was a ’68 factory drag car (one of 50 built) or a 1968 ½ production CJ (2,870 built). Bidders got exited and bid the Hemi Hunter Mustang to $475,000, or twenty-five grand more than the Hemicuda. Brent Hajek, famous factory drag car collector from Oklahoma, was wondering about the bidders. Did they fall for “smoke and mirrors?” Although I don’t know exactly why the CJ brought so much, the KR was a 6,000-mile original. You want to know if auction people are knowledgeable? I believe so. Basically, they want the cars and have the money to spend. 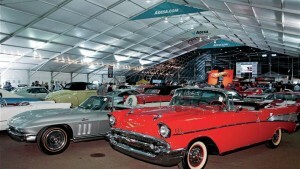 B-J and the other auctions in Arizona in January of every year have become the Super Bowl of collector cars. Car collectors get their world championships, so to speak, before the car show season even starts in the spring. B-J is an indicator of trends. It’s not just B-J setting prices. If you haven’t been to the January auctions in Arizona in four or five years, you are in for a shock. The scene has become so big there are FIVE big auctions staged by Barrett-Jackson, Russo-Steele, R-M Auctions, Silver Auctions, and Kruse International. Basically, what has happened is the numbers of cars have become so big in Arizona in January that one sale will not suffice. As the sales multiplied, each auction has taken on its own unique blend of makes and models. The need to get warm and get close to collector cars, which is very difficult to do in ice and snow, has developed into a tradition over the past thirty years. Kruse’s first collector car auction in January in Arizona was 1972, when this Auburn, Indiana-based company owned the sale and Tom Barrett, from Arizona, was their “rep” and Russ Jackson worked for Barrett. What was once one big sale became two big sales. The numbers of cars and buyers doubled. As the years passed, the numbers of cars and auctions continued to grow in Arizona in January. Today, we have five big auctions, each grossing multiple millions of dollars. In the 1970s, muscle cars were still used cars which got collectible when the gas crisis of ’73 hit. Prices were cheap then. I remember five grand for a Hemicuda convertible. In the mid-1980s, I recall 25 grand for a Hemicuda convertible. That price was incredible. The 1948 and older classics were the cars appreciating radically in value. It was impossible to believe that a production line American muscle car could be worth what a custom-bodied Packard or Lincoln or the king of them all, the Duesenberg, would be worth. But, those times have arrived. Craig Jackson is a muscle car owner and enthusiast and promotes muscle at B-J. Drew Alcazar worked for B-J and several years ago started his own auction company, Russo-Steele. B-J started Tuesday, January 18th and ran for an incredible six consecutive days. That’s one day longer than last year. R-S started Friday and ran through Sunday. Alcazar had his own “Concours Restoration” shop in Ranch Cucamonga, California in the early 1990s and knows cars. We shuttled between these two auctions, which are 2-3 miles apart. R-S caters to muscle, same as B-J. Muscle car prices were flying here, big time, too, as you can see in the lists. Just click on the links and go to the web sites for the five big sales. In Scottsdale, take the 101 Freeway Loop to Scottsdale Road, go south to Mayo Blvd. go about 2 miles to the first traffic light, that is Fort McDowell Road, make another left.